Tauck has announced that it will offer its first-ever cruises on the Douro River in Portugal next year. 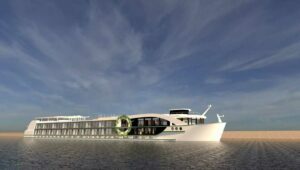 Tauck will feature three new Douro River itineraries aboard a riverboat that’s being designed and built specifically for the Douro. Carrying 84 guests, the new ms Andorinha will offer suites, spacious public areas, and an intimate ambiance that results from having fewer guests on board. As on Tauck riverboats fleet-wide, the new build will be staffed by a Tauck Cruise Director and three Tauck Director guides. Tauck is again teaming with its longtime partner Scylla AG on the design and construction of the ms Andorinha. The ship’s hull will be fabricated at Vahali Shipyard in Serbia, while final outfitting will be done in Hardinxveld, Netherlands prior to the ship’s launch in the spring of 2020. The new ship will have a crew of 36, and it will measure 263 feet in length with a beam of 38 feet. Guests will be accommodated in 42 cabins, including 12 300-square-foot suites on the upper Diamond Deck, and 20 225-square-foot staterooms primarily on the vessel’s Ruby or mid-level deck. The remaining accommodations – six 200-square-foot cabins and four 150-square-foot cabins – will be on the lower or Emerald Deck. Ms Andorinha will also feature a Panorama Lounge, Compass Rose restaurant for fine dining, and a second dining venue, Arthur’s (named for company chairman Arthur Tauck Jr.), serving more casual fare. The word “andorinha” is Portuguese for a species of swallow that return to Portugal each spring after wintering in Africa. Small ceramic sculptures of the birds became popular throughout Portugal, and because swallows typically return to the same nest each year with the same mate, the figurines have become symbolic of family, home, and fidelity. Tauck will offer three new Douro River itineraries aboard the ms Andorinha; a 12-day journey that bookends a seven-night Douro cruise with two-night hotel stays in Lisbon and Madrid, an eight-day “cruise-only” itinerary along the river, and an eight-day Tauck Bridges cruise designed for families with four departures slated for late June/early July 2020. Itinerary details and pricing will be announced later this year.